For many, summer vacation is quickly coming to an end. But, how about squeezing in one more little get-a-way before the dog days of summer are over? 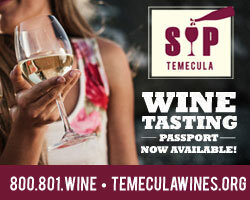 Whether you can get away overnight, or just want to take a day trip, a mid-week visit to Temecula Valley Wine Country should prove to be a relaxing and enjoyable break. There are many advantages to visiting wine country during the week. Much less busy weekdays are the perfect opportunity to allow yourself time to enjoy our 30+ member wineries’ offerings. At a slower pace, you’ll be able to enjoy more one-on-one time with the knowledgeable wine servers (or even the winemakers and/or winery owners themselves if you’re lucky) at each of your stops. In addition, the tasting prices tend to be lower during the week than on the weekends and some wineries even offer two-for-one wine tasting coupons and additional discounts if you’re tasting during the week. And, if we haven’t convinced you yet….there’s no waiting in line to dine at our wonderful wine country restaurants that are very busy on the weekends. If you’d like to spend the night you’ll be pleased with the selection of hotels and their reduced mid-week rates. Hotels in the area are generally booked months in advance on the weekends. If you plan to visit mid-week, check out the SIP Passport. This passport allows you to visit any five wineries of your choice for $45. Click here to purchase your passport. While we’d love to see you at any time here in Temecula Valley Wine Country, give us a try on a Wednesday sometime….we think you’ll be glad you did!